^ a b c d e f g h i j k l m "Airbus Orders and Deliveries" (xls). Airbus. 31 March 2019. Retrieved 4 April 2019. ^ a b c Kingsley-Jones, Max (10–16 June 2003). "The Minibus Arrives". Flight International. Retrieved 1 March 2011. ^ Norris, Guy (17 January 2019). "Airbus A320, A220 Evolution Considered As Mobile Expands". Aviation Week Network. ^ "Skybus Becomes First North American Operator of Advanced CFM56-5B Tech insertion Engine". GE Aviation. 3 December 2007. 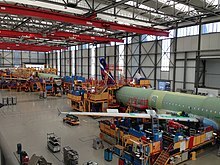 ^ "Projects and Results : Aircraft wing advanced technology operations". CORDIS. European Commission. 13 June 2006. ^ cesar soto (12 September 2007). 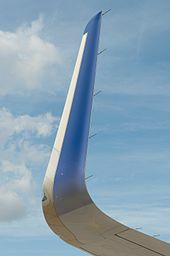 Enhanced Fap—Airbus 320. Youtube. ^ Graham Warwick (30 August 1986). "A320: fly-by-wire airliner". Flight International. ^ Charlotte Adams (1 January 2003). "Product Focus: Cockpit Displays: LCDs vs. CRTs". Avionics magazine. ^ a b David Learmount (20 February 2017). "How A320 changed the world for commercial pilots". Flight International. ^ Dominique Brière, Pascal Traverse - Aérospatiale (22–24 June 1993). "Airbus A320/A330/A340 Electrical Flight Controls: A Family of Fault-Tolerant Systems" (PDF). FTCS-23 The Twenty-Third International Symposium on Fault-Tolerant Computing. IEEE. 4.2 "Failure detection and redundancy". doi:10.1109/FTCS.1993.627364. Archived from the original (PDF) on 27 March 2009. ^ a b "Historical Orders and Deliveries 1974–2009". Airbus S.A.S. January 2010. Archived from the original (Microsoft Excel) on 23 December 2010. Retrieved 10 December 2012. ^ Alex Derber (29 August 2018). "How The A320 Overtook The 737, And MRO Implications". Aviation Week Network. ^ a b "The Airbus A320 family vs the Boeing 737 family: Who's got the muscle?". The Flying Engineer. 30 May 2010. ^ Aircraft Value News (21 January 2019). "Prices of New A320s Hardly Changed in 20 Years". ^ Aircraft Value News (21 January 2019). "Values of A319 Continue to Taper Down". ^ David Kaminski-Morrow (10 December 2018). "Conventional A320-family backlog drops below 200". Flightglobal. ^ "Safety Recommendation A08-53" (PDF). National Transportation Safety Board. 22 July 2008. p. 2. 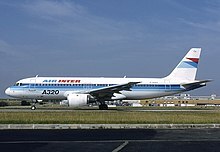 According to Airbus, as of May 2007, 49 events similar to the United Airlines flight 731 and UK events had occurred in which the failure of electrical busses resulted in the loss of flight displays and various aircraft systems. ^ a b c d "Type certificate data sheet No. EASA.A.064 for AIRBUS A318 – A319 – A320 – A321" (PDF). European Aviation Safety Agency. 5 November 2018. Archived from the original (PDF) on 5 November 2018. Retrieved 7 December 2018.